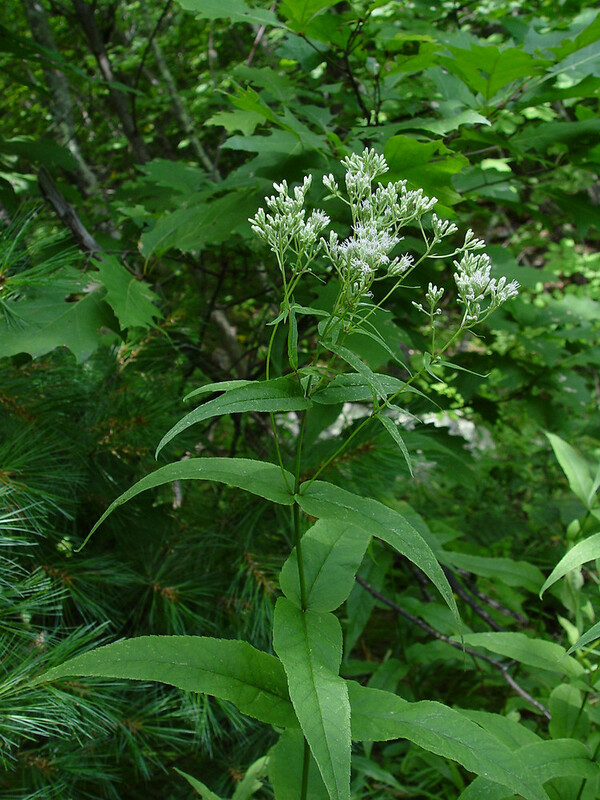 Eupatorium sessilifolium. By Donald Cameron. Copyright © 2015 Donald Cameron.New England Wild Flower Society.gobotany.newenglandwild.org (Accessed 2/2015). Eupatorium sessilifolium is a perennial herb, 60-150 cm tall, 1-stemmed from a root crown, stem slender, smooth. Leaves opposite, stalkless (sessile), blade lance-shaped, very smooth, bright green, 7-18 cm long, 1.5-5 cm wide, thin, base rounded, tip long-tapered, margin toothed, veins pinnate. Flowers white, in small rayless heads of 5 flowers, bracteate base (involucre) 0.5-0.6 cm long, bracts overlapping, blunt-tipped, finely hairy; inflorescence dense, branched, flat topped; blooms Aug.-Oct.
Fruit dry, 1-seeded, 5-angled plumed achene, wind dispersed. Habitat: Upland woods, sandy, acid soils.